Richard Harold Blackmore grew up in the post rock’n’roll/skiffle era as a contemporary of Jeff Beck, Eric Clapton and Jimmy Page. He had the chops to match them but was never so revered. His best work with Deep Purple and later Rainbow, though, has stood the test of time. Now, with a surprise Rainbow reunion just around the corner, a reappraisal of this most unique and maverick of guitarists is long overdue. After completing Jon Lord’s neo-classical Concerto For Group And Orchestra, the Mark II line-up of Blackmore-Gillan-Glover-Lord-Paice got down to serious business with 1970’s Deep Purple In Rock album. The sessions spawned Child In Time and Black Night but nothing so brutal as this eight-minute bulldozer that showcased all five members yet somehow never made their live setlist. 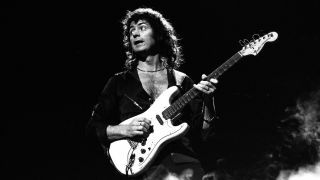 The title-track to 1984’s Mark II re-formation album saw Blackmore showing that anything Jimmy Page could do with Eastern scales he could match effortlessly. Unusually, though, the song structure sees him eschew a traditional solo spot so you’ll have to listen hard as he weaves in some clever noodlings and whammy bar divebombs. Roger Glover’s lyrics are irredeemably sexist, but Blackmore’s hook is irresistible. The band’s recruitment of singer Graham Bonnet heralded a run of three consecutive top five hits that made Rainbow Top Of The Pops regulars. Sandwiched between Russ Ballard covers Since You Been Gone and I Surrender (with Joe Lynn Turner singing) this self-penned hit peaked at No.5 in the UK in February 1980. The high-octane opening cut on Deep Purple’s best studio album, Machine Head, this combined the eternal themes of fast cars and fast women to perfect effect. The band instantly made it their live set opener and the Made In Japan version, recorded on 16 August 1972, is among the best committed to tape. A drunken jam after a night in the pub resulted in this 1970 hit that reached No.2 in the UK and Germany. In concert, Purple saved it for a rabble-rousing encore, recording a splendid version in Osaka on the same night as Highway Star – though there wasn’t room for it on the original vinyl version of Made In Japan. Building from three subtle Jon Lord notes this epic In Rock track soars into a galloping mid-section boogie over which – starting just after the four-minute mark – Ritchie delivers one of his greatest solos. The song then begins again, climaxing in a musical maelstrom over which Ian Gillan screams his heart out. This monumental tale of enslaved villagers building a tower of stone for a wizard to fly to the stars from is the perfect marriage of Ronnie James Dio’s voice and Blackmore’s guitar. Another stunning solo from The Man In Black drives Rainbow to their bombastic best – with the Munich Philharmonic Orchestra stirred in for good measure. The signature track on 1974’s eponymous album which introduced the world to David Coverdale… There are many amazing live versions, but this song is so good that the studio original can still hold its own. Blackmore’s heavily accented riff completely reinvents George Gershwin’s Fascinating Rhythm hook – and the solo is incendiary. Will Ritchie's Rainbow rise... or plummet down to Earth?